Image caption Dirty Watercolour was sparked by the looming loss of a beloved river in the Philippines. 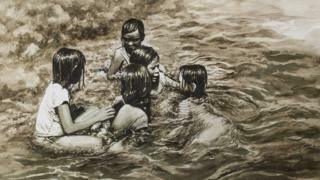 In the corner of a room in Manila, an artist dips his paintbrush into a murky mixture. As brush strokes of brown, black and grey sweep across white canvas, the paint leaves behind rough sediments on the surface, coming out as an almost gritty texture. But this isn't any ordinary paint. The mixture is composed of water samples drawn from the most polluted rivers and tributaries of the Philippines capital. Image caption The Tullahan River is one of the dirtiest in Metro Manila. The Dirty Watercolour project aims to use art to promote awareness of environmental degradation. "What better way to raise awareness than to make use of the very medium, which is of course, water," said curator Cid Reyes. The pigments - a range of black, grey, sepia, burnt sienna and brown - were taken from riverbed soil samples. They were first processed, de-contaminated and oven dried for 24 hours, before being mixed with gum arabic solution to become watercolour. Image caption Pigments were taken from the Cainta, Tullahan and Marikina Rivers, as well as the Taguig Estuary and the Binondo Canal. "I was stunned when I first heard this idea," said JC Vargas, one of nine watercolour artists commissioned to paint images using these sterilised pigments. "It is so unique yet challenging for me as a watercolourist to use dirt to create art." Though the pigments are decontaminated, they still give off a smell when painting with them, says Mr Vargas. Image caption "Stinky" is the word artist JC Vargas uses to describe the pigments collected from the river. "The pigments are smelly and gritty, even when you paint with it. The stink only goes away when the pigments dry off." One of the biggest challenges was having to actually collect the water from the rivers. Image caption Collected water samples from the rivers were decontaminated then oven dried for 24 hours. "We literally had to dip our feet into the mucky river," said Mr Vargas, an architect by profession. "Just by simply smelling the air, you can easily tell that it is hard to live along these rivers." Yet many do. Shanty towns and slums along Manila's rivers are a common sight, where children can be seen bathing and jumping into the toxic waters. Many of these towns have no sewage facilities, running water or such amenities. These images serve as inspiration for Dirty Watercolour's paintings, with the team taking pictures of everyday scenes along the rivers before translating them to art. "My favourite painting is a piece entitled Sabina," Mr Vargas tells the BBC. "It features a child playing innocently by the river, unaware that her playground is unsafe." Image caption Sabina took JC Vargas two days to finish. In 2004, five of Manila's rivers were declared biologically dead, so contaminated with slit, crude oil, heavy metals and biological waste that nothing can live in them. The Pasig river, Manila's longest at 25km (15 miles), lies at the heart of this, feeding tributaries such as the Marikina and San Juan Rivers. It also served as the main inspiration for the Dirty Watercolour team. Image caption The Philippine government has tried for many years to cleanse the polluted rivers. The 22-piece project, featuring everyday scenes along the river, was completed in slightly less than a month. "For me, Sabina was the last piece I made for the exhibit, and it took me only two days to finish it," said Mr Vargas. Image caption The polluted water samples were decontaminated through autoclave and concentrated to produce different colours. It then took the team six months to mount the exhibit in Manila's Rockwell Centre where it ran last week. "The pigments were very challenging to work with, with the colours all on the monochromatic side", said Melvin Mangada, agency head of TBWA\SMP, the creative force behind the project. "Even without the usual colours, the artists came up with beautiful images that are full of emotions. Emotions that colour the Filipino life." Image caption JC Vargas, Kean Barrameda, Fred Failano, Allan Clerigo, Van Isunza, Luigi Almuena, Renee Ysabelle Jose, John Ed de Vera and Toti Cerda are the nine artists behind the project. The paintings are priced from around 40,000 pesos ($860; £583) to 120,000 Philippine pesos, with the proceeds going towards the rehabilitation of dead rivers. "Reviving these rivers will help those living by the rivers to improve their lives," said Mr Vargas. "I believe there is still a chance. I hope our artwork has made impact not only here in the Philippines, but also in other countries." Image caption All proceeds of sales will benefit the ABS-CBN Lingkod Kapamilya Foundation, to continue with their work of saving the Pasig. "Bodies of water will be in our lives forever, so let's take care of them." The Pasig river once served as inspiration for a classic Filipino song, Mutya ng Pasig, written by Nicanor Abelardo, the National Artist for Music. Image caption The polluted rivers of Manila are now being use as a source to promote awareness of water pollution. "If you want me to live, give me your love," say the lyrics. "The river has now lamentably become a black ceaseless flow of muck and misery," said Mr Reyes. "Dirty Watercolour sends out a message, post haste, that we should bring the colour of life to a dying Pasig, until the muse of the river sings back that you have indeed given her your love."